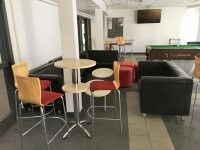 Services / facilities within the building include meeting room and conference rooms. On the lower ground floor is the Halstead Room. On the ground floor is the Quenby Room. On the first floor is the Swithland, Tilton, Oakam and Rothley rooms. 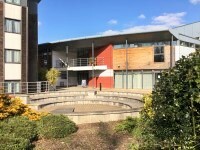 John Foster Hall is located to the south of Leicester City Centre and the main University Campus, in Oadby. Manor Road is accessed off Stoughton Drive South, which in turn is accessed off the A6 Leicester Road, close to the City Outer Ring Road. Parking is available on this site. Bus Routes 40, 80 and 80A stop on Manor Road, just outside this site. 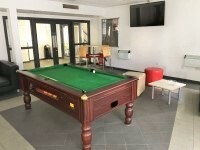 The 80 and 80A routes link this accommodation to the main University Campus, and the 80 bus also goes to the City Centre and the Station. Leicester Station is located on the south side of the City Centre, just off the Inner Ring Road. Manor Road can be reached from here using the 80 bus. Leicester is on the London - Sheffield and the Birmingham - Stansted lines. 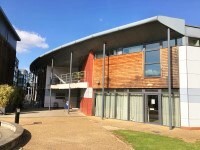 The car park is located opposite the facilities building. 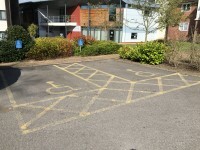 The nearest building(s) to this car park is/are the Facilities Building, John O Gaunt, Kilby. 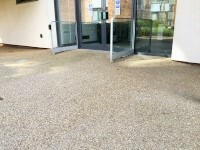 The dimensions of the designated parking bay(s) are 360cm x 600cm (11ft 10in x 19ft 8in). 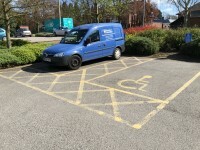 This car park can be used by anybody. There is sloped access to the car park from the Manor Road. The nearest designated bay is 26m (28yd 1ft) from the facilities building. You are on Outside Access (Main). Skip to the next section. The door opening is 128cm (4ft 2in) wide. You are on Outside Access (Rear). Skip to the next section. The door opening is 185cm (6ft 1in) wide. 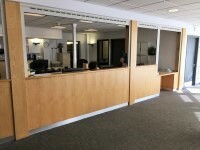 Main Reception is located within the facilities building. 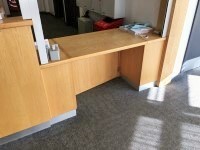 The desk is 12m (13yd 4in) from the main entrance. You are on Getting Around (Ground Floor). Skip to the next section. 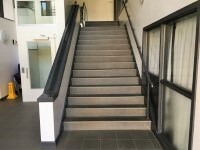 There is/are 10+ unmarked step(s), with handrails on both sides, for access to the ground floor from the lower ground floor (rear entrance). 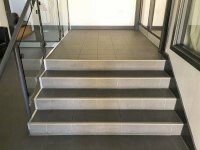 There is a platform lift which overcomes the steps. Photograph 1 shows the 10+ steps leading from the ear entrance to the ground floor. There is/are 4 unmarked step(s), with a handrail on the left going up, for access to the Quenby Room. 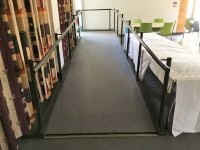 There is a moderate ramp, with handrails on both sides, for access to the Quenby Room. Photograph 2 shows the 4 steps leading into the Quenby Room. Photographs 3 and 4 show the ramp that can be used to bypass the steps. The ramp is located within the refectory. There is a fixed hearing loop available that covers the entire building. You are on Lift (Rear). Skip to the next section. 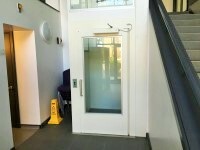 The lift is approximately 6m (6yd 1ft) from the rear entrance. 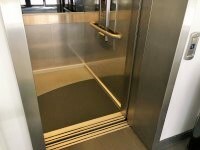 The lift door is manual, heavy and opens outwards. 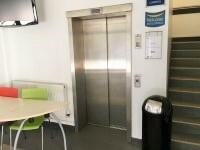 The dimensions of the lift are 105cm x 145cm (3ft 5in x 4ft 9in). 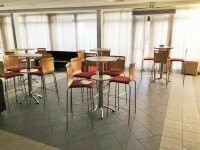 The nearest table is 2m (2yd 7in) from the bar entrance. The distance between the floor and the lowest table is 39cm (1ft 3in). The standard height for tables is 110cm. There is not ample room for a wheelchair user to manoeuvre. 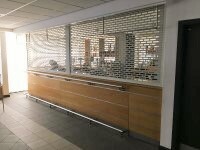 The is not a public bar, but is hired out for functions. 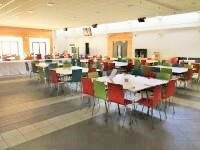 You are on Eating and Drinking (Dining Hall). Skip to the next section. 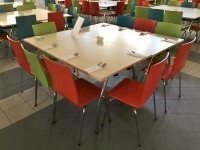 The nearest table is 5m (5yd 1ft) from the refectory entrance. The standard height for tables is 75cm. 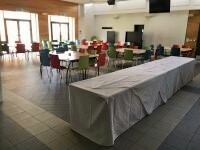 The this is not a student dining hall, but is hired out as a Conference Facility. The lift is located ahead as you enter through the main entrance. 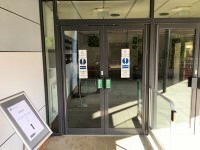 There are manual, light, double doors to enter and exit the lift lobby on the first floor. 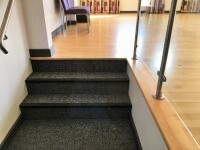 There is step free access throughout the first floor. 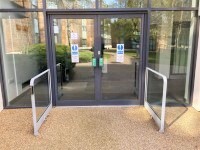 There is/are 3 unmarked step(s), with handrails on both sides, for access to the Oakham Room. 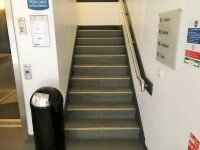 There is an easy slope, with no handrails, for access to the Oakham Room and first floor accessible toilet. Photograph 1 shows the 3 steps into the Oakham Room. The steps into the Oakham Room can be bypassed by entering via the Rothely Room. This is only possible when the partition wall is retracted. 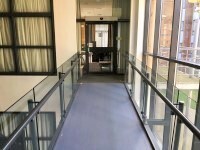 Photograph 2 shows the ramp that provides access to the entrance to the Oakham Room as well as the first floor accessible toilet. There are not doors which have to be opened manually in corridors. You are on Accessible Toilet (Main). Skip to the next section. 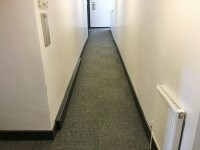 This accessible toilet is located to the left as you enter through the main entrance off the corridor. 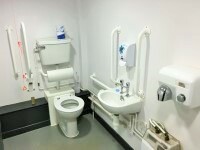 The dimensions of the accessible toilet are 140cm x 180cm (4ft 7in x 5ft 11in). You are on Accessible Toilet (Rear). Skip to the next section. 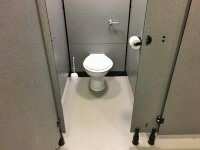 This accessible toilet is approximately 10m (10yd 2ft) from the rear entrance. This accessible toilet is located on the left as you enter the building. 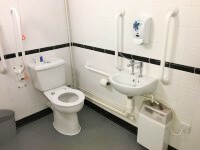 The dimensions of the accessible toilet are 145cm x 255cm (4ft 9in x 8ft 4in). 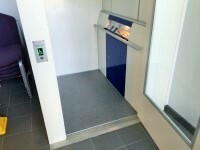 This accessible toilet is approximately 25m (27yd 1ft) from the lift. This accessible toilet is located at the end of the ramp to the right as you exit the lift. The dimensions of the accessible toilet are 145cm x 245cm (4ft 9in x 8ft). 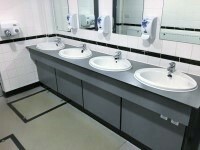 There are male and female standard toilets facilities on the lower ground floor and the ground floor. The toilet surveyed is located to the left as you enter through the main entrance off the corridor. 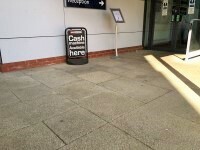 The standard toilet surveyed is approximately 15m from the main entrance.